My friend asked me to make some party decor for a flamingo and pineapple themed bachelorette party. So craft I did! 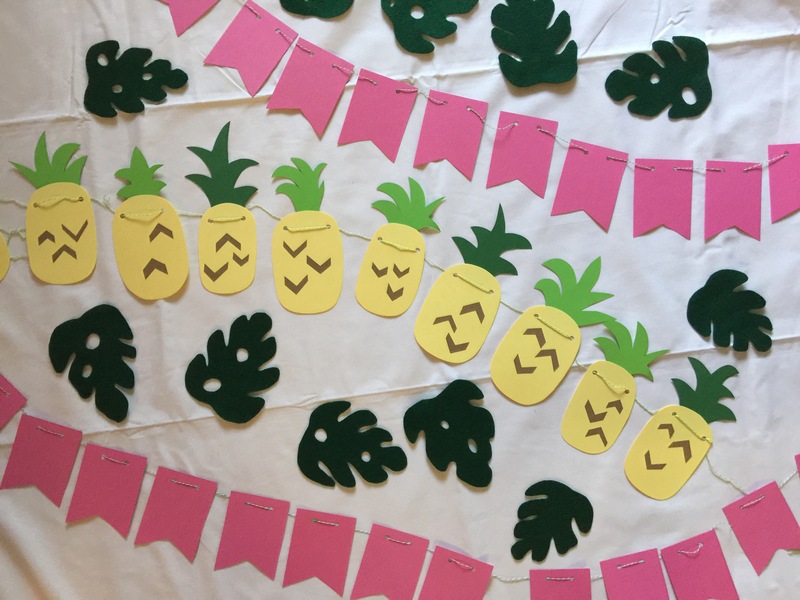 Paper pineapples, hot pink bunting, and felt leaf confetti. And…and…and…mini pineapple piñatas! Glue strips of crepe streamers to the bottom and sides of the cup. The streamers don’t need to lay flat on the cup (they can be slightly wrinkled); just make sure they stay put. Cut fringe into strips of crepe streamers. Glue on one piece of fringe to the cup starting at the open end. Add the second layer slightly overlapping the first. Continue adding layers until you reach the bottom of the cup. Fill your mini piñatas with confetti of choice. I created my own mix with tissue paper confetti, die cut flowers & leaves, paper scraps, and of course, sparkly hearts. Cut circles to fit over the mouth of the cup. Punch a tiny hole in the middle, string through ribbon and tie knots on both ends to keep the ribbon from slipping through. Fold the fringe back slightly, apply glue stick to the mouth, and press the paper onto the cup. Add glue to the fringe. Fold and press the fringe onto the bottom of your piñata. Trim excess fringe. Cut zig zags into the felt, roll, and hot glue. Attach to the bottoms of the cups / tops of the pineapples with hot glue. Pineapple piñatas for the win! Ready for the confetti party! What other fun mini confetti piñatas should I make? Share your thoughts below!